EIA TOWER (31) The new NAV CANADA Control Tower at EIA offers a wide view of the runways, with paperless state-of-the-art technology. Leduc County AB – Disclosed globally via TV broadcasts, website shared images and daily newspapers, the recently-launched NAV CANADA Control Tower and Edmonton International Airport’s (EIA) Baggage Handling Area are state-of-the-art facilities that this reporter was honored and happy to visit, as non-airport employees rarely are allowed within. NAV CANADA shares their company profile: “NAV CANADA is the private sector, non-share capital corporation that operates Canada’s civil Air Navigation Service (ANS).” Its safety procedures and performance are regulated by Transport Canada. Through its seven area control centers in our country, NAV Canada employs 4,000 Canadians. Gathered in a bright EIA boardroom, a group of media people representing most of the leading Edmonton electronic and print media were invited to tour two highly-controlled areas and showed up with obvious anticipation. Reg Milley, CEO of EIA, a retiring executive who has left a dynamic mark on this International Airport’s growth and vision, welcomed the group and shared his enthusiasm for this latest expansion of his airport’s operations. The first objective is to go visit the new Control Tower. Greeted by a NAV CANADA official and Mark Anderson, Unit Operations Specialist, the group makes its way up the lone and narrow staircase that leads to the ‘mysterious and high-tech’ Air Traffic Control Room. With numerous computer screens covering the entire circular desk that lines the 360 degree windows, it is state-of-the-art. As the media visitors speak quietly, it is fascinating to observe the wide view that is obviously well-used by the three Air Traffic controllers on duty. A fascinating concept (even to the more experienced newshounds…) was the Unit Operations specialist’s large curved desk that went up and down at the touch of a button, to allow him (or her) to work sitting down or, when the circumstances require it, to work standing up with a better view of air traffic with his/her computer screens and keyboard close for easy access. Workers could be seen close by, on the roof of the Central Tower, putting some finishing touches in place. NAV CANADA officials shared that this computer system they designed and implemented successfully is so amazing and technologically advanced that it is in use in 80 facilities worldwide. 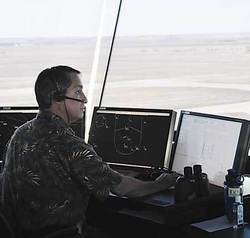 This paperless system that allows greater efficiency and safety in air traffic operations was endorsed and launched seamlessly by local air traffic controllers. At the bottom of the Central Tower, the media group is led to the hallowed halls of Baggage Handling that will now be more automated and technically supported than ever before. Our group enjoyed this warm, a bit loud and freshly-built facility, where red and yellow are the accent colors: the control panels seem complex, but we are informed that personnel have been trained properly and that they are quite enjoying the new faster and efficient technology! A member of the press corps was bold in asking if we would have the opportunity to view and photograph the Central Tower from the outside, and having Jason Sangster, an Airport Security official as a host, made the request easy to satisfy! We were led outside, under the watchful eyes of security personnel, and were able to photograph the majestic and tall Tower close up. Visible from the Airport’s main road, the unusual eight-story high Control Tower is perched above the Central Tower that was designed by the Edmonton-based DIALOG in conjunction with their construction partner, Ellis Don. It is fascinating to observe that each story has a “sculpted ribbon that provides shade from the summer sun and will capture sunlight in winter”. Many airport visitors had speculated on this unusual feature while construction was in progress. Higher than the previous control tower whose fate has yet to be decided upon, the New Airport is a feat of modern and ‘spirited architecture’, and it was a thrill to see it up close and personal. With more shops and dining options completed through the EIA Expansion 2012 Project, the Edmonton International Airport is a destination in itself, one that continues to grow and follow the rhythm of a successful economy and the ever-growing trend of air travel. The Pipestone Flyer wishes Mr. Milley and his wife Marcie a happy and healthy retirement, as he has been a true Prince and sincere promoter of our region for many years!